Michael Craven – Resource Concepts, Inc.
Mr. Craven has a diverse background in both engineering and surveying. As a native of South Lake Tahoe he has a wealth of local knowledge and familiarity. He provides a forestry background and expertise through his education, as well as his experience in engineering and surveying, for the timber industry in Washington. 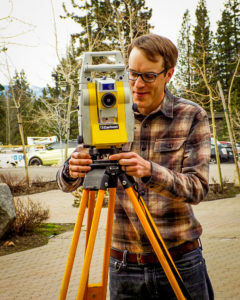 His experience includes forest road and drainage design and construction, timber harvest planning, surveying, and the use of aerial LiDAR and GIS analysis. Having recently taken on additional duties as RCI’s Assistant Survey Director, Mr. Craven is actively working towards one of his long-term goals of becoming a licensed land surveyor. His unique background of technical education, field experience, and interest in the practical application of engineering design, surveying and construction offer our clients a resource sensitive, practical focus of their project needs. Michael enjoys working at RCI. RCI is unique in the area for the services it offers, and the professionals who’s experience make those services possible. Working at RCI allows one to learn from a multitude of disciplines and work on a wide variety of projects resulting in an enjoyable place to work and an excellent opportunity to grow a career. When Michael is not busy surveying, he enjoys mountain biking, hiking, snow sports and photography.